Knowing Your Business interview Mary Thomas from Concise training. The show topic of conversation was training and development so we asked Mary to tell us her story from starting out to where she is now. You can enjoy this enthralling interview further down the page on podcast. Asking the all important questions is regular guest presenter and renowned people skills training / development trainer, and author Julie Cooper. This is a 1:17 second snippet where presenter Julie Cooper asks Mary how she manages the training changes in social media. In this little 3:33 second snippet we hear how the training course works and what happens. Hear the FULL interview where Mary tells us a story filled to the rim with learning and where that has taken her. Super story A fascinating interview awaits your ears. Author of ‘Social Media Made Simple’, a workbook endorsed by City & Guilds, to get you started with Social Media in the right way. Also author of ‘Using Social Media for Personal Gain’, available as a free download on BookBoon. Worked as a Consultant for Price Waterhouse from September 1988 – February 1998 (9 years 6 months) on a variety of systems development projects. Roles included programming, design, analysis, testing, user acceptance and training. 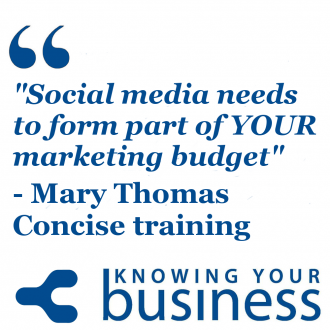 During 2010, Mary got tired of hearing about so called ‘Social Media experts’ offering their services to companies as experts for vast sums of money. These ‘experts’ often only had 10 followers and were learning on the job, but they could “talk the talk”. Mary established the first accredited Social Media qualification – the ITQ in Social Media – in 2011 for people to learn how to use Social Media properly and to have a qualification to provide integrity. Knowing Your Business Show time is every Thursday from 10 am until 12 noon on Radio Horton. If you have any questions for Mary, or would just like to leave a comment, please do.